Back at the beginning of October, sources of ours (which Verizon confirmed) informed us that unlimited data plans on Verizon would see a $20 per month price hike starting November 15. A whole bunch of you saw our report, along with the follow-up we did with additional details on who it affected, and came away (rightfully) pissed off. However, it has become clear to us within the past week that not everyone saw it, because our inbox has been pinged multiple times per day with freshly angered Verizon customers who are just now learning about the increase on the way to their monthly bill. 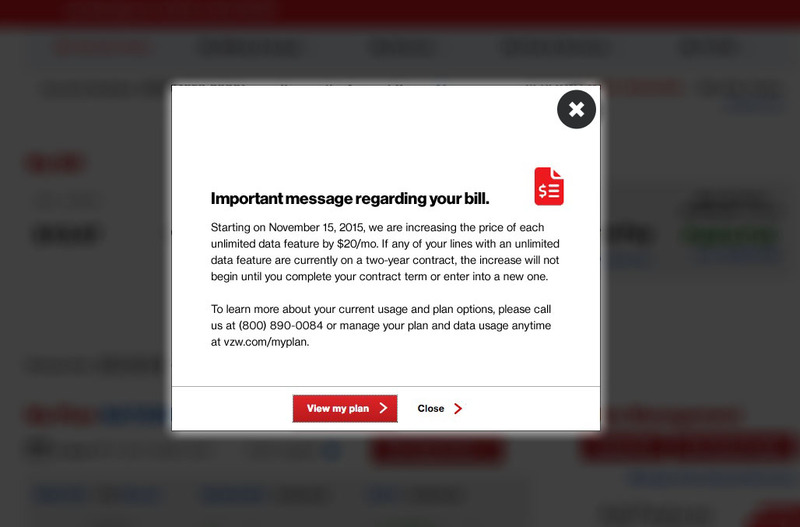 It appears as if Verizon started notifying unlimited data plan subscribers at the beginning of November by welcoming them to their online account page with a pop-up, a pop-up that we have included at the top of this post. As you can see, it does indeed say that on November 15, they are increasing unlimited data feature pricing by $20 per month for those not currently in a 2-year contract. Keep in mind that this increase does not affect you if you are currently under contract or enter into a new one. That’s right, there is a way to avoid the increase! If you can find an unlimited-data-keeping work-around that still works that will lock you into another 2-year contract, now would be the time to do it. Here are some examples of the types of tricks you can do to keep unlimited data at Verizon while upgrading. Long story short – yes, Verizon is upping your unlimited data plan pricing to $49.99 per month, which is a $20 increase of the $29.99 you have paid since the beginning of time. You have 6 days to figure out a way to avoid that increase.